TriMet wants to thank the 150 plus beta testers of our TriMet Tickets mobile ticketing app, who became the first in the nation to conveniently and easily buy and use mobile tickets for rides on a multimodal transit system. The beta test ended yesterday, July 8, with 2,232 tickets purchased. While breaking up is hard to do – the testers are now back to physical ticket purchases – they will see the benefits from the beta test when TriMet launches the free app to all riders in August. During the test period, which started May 16, testers on average purchased about a dozen tickets. The mobile tickets were launched 3,374 times and riders were using the tickets for transfers and round trips. The testers shared feedback, responded to multiple surveys about design and functionality and participated in focus groups. TriMet staff and local software partner GlobeSherpa will be taking the testers’ feedback and making improvements to the mobile app before the public launch next month. Once the TriMet Tickets app becomes available in August, you’ll simply download the free app to your smartphone, enter your credit or debit card information into the secure system and then buy and use the fares with just a few taps of the screen. No searching for loose change. No additional steps for purchasing tickets. One week ago, July 1, TriMet launched a new ticket printing system on all our bus lines. An onboard ticket printer located to the right of the fare box produces tickets that are easier to read and more durable compared to the old newsprint transfer slips. In the first week, we printed up about 200,000 of the tickets and the response has been great from riders and operators. 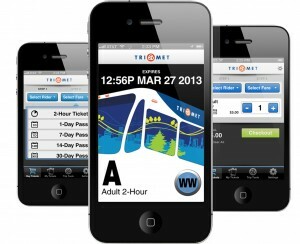 The new bus tickets and the TriMet Tickets mobile ticketing app will help us get to a state-of-the-art electronic fare system that we hope to begin implementing in 2015. The highly anticipated app will provide yet another outlet for ticket purchase in addition to traditional paper and cash fares available via retail outlets, the TriMet Ticket Office, fare boxes on buses and ticket vending machines at MAX/WES stations.